Play /plā/, n., v., played, play·ing – activity engaged in for recreation and fun. The voices of children playing can be heard on Powhatan’s playground, wooded areas, and fields just about every hour of the school day. 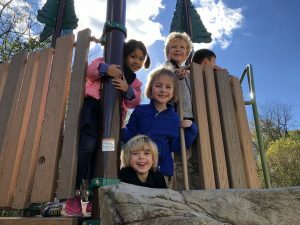 Whether it is sliding down a slide, hitting a ball in the ga-ga pit, building a stick lean-to by a tree, or running laps on the fields – play is a part of every students’ experience at Powhatan! Powhatan’s sixty-seven-acre campus is brimming with play spaces – both indoor and out. With multiple buildings and outdoor areas for exploration, students have easy access to our Makerspace, the Crocker Conservatory, outdoor learning labs and many other inspiring play spots. Outdoor time is provided in the schedule each day. Sports occurs each day in the upper school and three times per week in the lower school. This schedule, along with a vibrant arts program, encourages many ways for creative expression, movement and open-ended activities. Powhatan’s Early Childhood Teaching Staff knows that play is a student’s work at the youngest ages. Our newly renovated kindergarten and first grade classrooms have bright open spaces which can be used for noisy or quiet play and exploration. Various materials, such as blocks, sensory tables, dramatic play items and art materials are readily accessible. Pre-kindergarten students have play lab each morning where cross-disciplinary centers provide varied hands-on activities. Powhatan’s community was honored to hear Dr. Dorothy Sluss, Professor Emerita from James Madison University, speak about her lifetime passion of studying children’s play. Click on the podcast at the top of the page to hear my follow-up conversation with Dorothy about the benefits of play. Collaboration, communication, critical thinking, and creativity are all skills which are enhanced through play. At Powhatan, time to play and build these skills starts in the youngest grades, laying the foundation for a balanced, healthy life in the middle school and beyond.